When excessive moisture contacts carpet, the carpet can be seriously degraded. Often it cannot be saved, but, unless the water has saturated the carpet and is not dealt with quickly, it is possible that the carpet can be restored to its normal usability. Speed is a critical component. An immediate call to CRM Services’ Emergency Hotline is essential. CRM Services’ systematic water extraction and drying equipment are state-of-the-art and are deployed efficiently to maximize cleaning power and restoration. 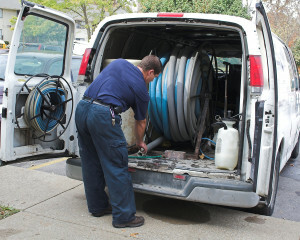 Our highly experienced experts know how to address carpet cleaning challenges. No two scenarios are the same in cleaning carpets. The chemical makeup of the carpet, the type of chemicals in the flood water, the volume of dirt deposited and time of exposure – they all present a distinct challenge. So expertise, advanced equipment and experience can make a tremendous difference. In addition, carpet repairs are sometimes needed. Debris can impact carpet. Tears are frequently a by-product of flooding. Our expert craftsmen are experienced at repairing carpet that may, at first glance, seem irretrievable. Everything is about restoring your carpet to usability whenever possible, and to accomplish that restoration as quickly as we can and at the least possible cost.